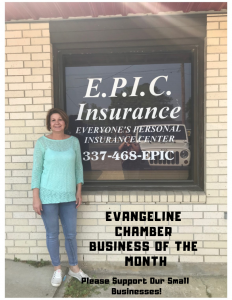 Welcome to the Evangeline Chamber of Commerce website. We’re located in the “Heart of Cajun Country” . We are the voice of the business and professional community. We’re dedicated to the growth, economic development and the quality of life of all residents. The Evangeline Chamber of Commerce advocates for you and your business. We seek to provide the active support of advocacy, building respect for your views and promoting the voices of the people and organizations that place their trust in us.